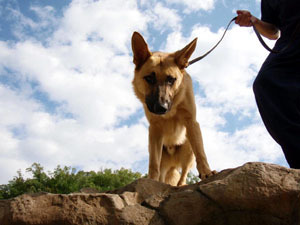 Our German Shepherd training program is an in-board boot camp designed specifically for the working GSD. Dogs and puppies enrolled for this training will learn to sit, down, heel (walk at your side without pulling), and come on command. The In Dogs We Trust boot camp is designed to address the training needs for a dog or puppy of any age, we can customize the program to meet your needs. The German Shepherd dog is highly trainable, with the proper balance between motivation effective communication it can be trained to be the best companion and working dog for the family. If any of the programs listed here do not meet your needs, contact us for a customized training package. Our dog training facility is located in St. Peter, MN - just north of Mankato. We service all of Minnesota, including Minneapolis and St. Paul. The owners of In Dogs We Trust, LLC. are proud to be member of both the International Association of Canine Professionals, Schutzhund USA, United States Mondio Ring Club of America, and the Protection Sport Association.